LOS ANGELES-This is why they play the game. 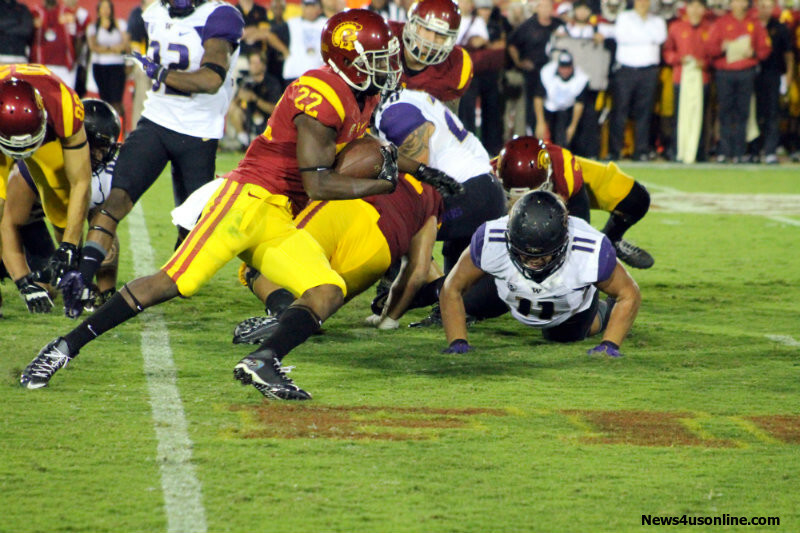 On paper, playing the Washington Huskies at home looked to be an easy win for USC. After strutting their stuff in a lopsided, proven victory on the road against Arizona State, the Trojans walked into the Los Angeles Memorial Coliseum as heavy favorites to come away with their second Pac-12 Conference South Division win. Not so fast. The Huskies had other things in mind, mainly, a 17-12 upset road win that pretty much kicked in the Trojans aspirations for a national title run and delivered a severe blow to USC’s chances of winning the conference crown. It’s not the end of the season, but it was a devastating loss for a team that was once ranked as high as No. 8 in the country. One might say that the Huskies put the bite into the Trojans. For sure, this defeat is going to sting USC for awhile. The way they played on defense all night against the Trojans, Washington seemed to play with a bit of a chip on their shoulders in their first game against former coach and now USC head man Steve Sarkisian. More impressively, the Huskies did something that didn’t seem possible, and that is they managed to bottle up Kessler and the Trojans’ high-flying offense that came into the contest averaging 316 passing yards a game (No. 17 in the nation). Washington held Kessler, who started off the season as a leading Heisman Trophy candidate, to just 156 yards through the air on 16 completed passes from 29 pass attempts for the game. 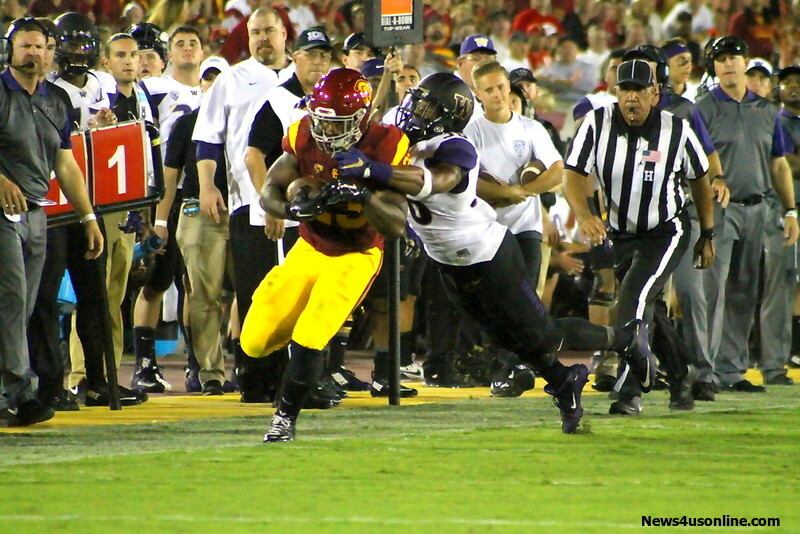 JuJu Smith-Schuster (6 receptions, 82 yards) and Adoree’ Jackson (3 catches, 3 yards) wound up not being even on the productive radar screen as the Huskies’ aggressive play kept the Trojans’ playmakers in check throughout the evening. Yeah, it was that kind of party. It was the kind of party the Trojans’ football team would rather not attend. The Huskies established their defensive will on the flow of the game on the first series. The first time Kessler dropped back to pass he was knocked to the ground under a heavy rush. He would throw an interception the next time he went back to throw. 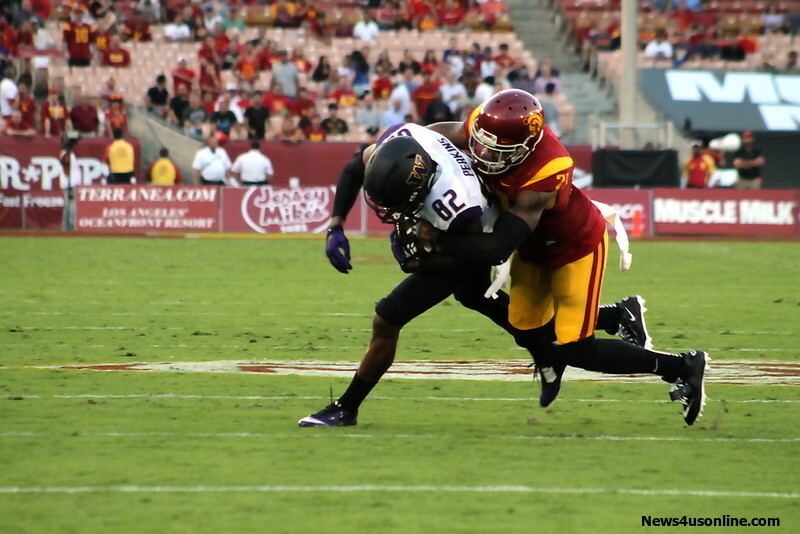 For the first time this season, the Trojans’ normally explosive offense didn’t have any real continuity. Nor did it have an answer to Washington’s smothering, over-the-top defense, although the Trojans’ antidote of running the ball proved to be effective with Tre Madden (17 carries, 120 yards) and his running mates accounting for a total of 190 yards on the ground. As the Huskies effectively took away USC’s passing game, it also took away the Trojans’ offensive identity and ability to make the quick-strike play that usually puts fear into opponents. That wasn’t the case against Washington. The Huskies didn’t play like a team intimidated by the Trojans’ previous success. They played USC like a conference rival-tough. Now with their second Pac-12 Conference loss in front of their home crowd, it’s the Trojans that need to get fired up or else their promising season could wind up looking like one of missed opportunities.